Information on the screening of an award-winning documentary film called “A Whole Lott More” about employment issues faced by people with disabilities. With Focus on Disability’s important remit of supporting people with disabilities, “A Whole Lott More” will be of real interest. It follows three individuals, each of whom has a different attitude towards employment and a different disability. 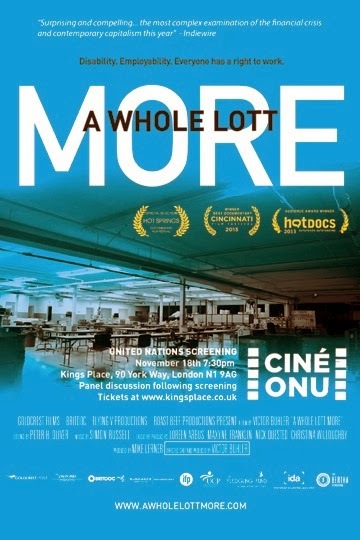 To honour International Day of Persons with Disabilities, the United Nations is hosting a very special preview screening of “A Whole Lott More” in London. You can view a trailer of the film at website: awholelottmore.com Though filmed in America, “A Whole Lott More” touches on key issues that are very relevant currently in the UK. Following the screening is a terrific panel discussion about disability employment. The screening takes place on Monday November 18th at 7:30pm at Kings Place. For more details and to book tickets please click here. Please do not hesitate to contact the outreach Producer Kate Ansell at kate@awholelottmore.com with any further questions. An informative, inspiring and entertaining evening is envisaged in showing this important film for the first time in London. The United Nations and BRITDOC present A Whole Lott More. Disability. Employability. Everyone has the right to work – A Whole Lott More is the story of Kevin, TJ and Wanda, all with developmental disabilities. For them, work is much more than just a monthly pay cheque. It is a chance to be independent, to be included in society. TJ and Wanda contemplate the future as the car part factory they work in faces closure, while Kevin sets out to join the working world for the first time. Though set in Toledo, Ohio, the questions raised by the film have strong parallels with issues faced by the UK, where over a million disabled people who would like to work are currently unemployed. Are we offering the right support? Can we do more? Sarah O’grady of the Daily Express has revealed jobless homeowners would have to hand over a share of of the value of their property in return for taxpayers help to pay their mortgage under new government plans. People would get help with payments indefinitely but the state would recoup some of the money when the property was sold. The Department of Work and Pensions confirmed on Monday 4th November there are plans to claw back the money. It would save millions on the welfare bill but would be controversial. Opponents fear ministers would use the equity in people’s homes to fund other areas of the welfare state. It will be seized upon by the left as further evidence of the heartless Tory policies. In return for paying towards the mortgages of unemployed homeowners the state would recoup some of the money when the claimant died or sold the property. Other opinion is that it is not as draconian as it first sounds. Surely it is better to help people remain in their own homes when they are in difficulty than face the trauma of mortgage default and repossession? Turning a benefit into a loan is in line with the government’s attitude to welfare reform, which has personal responsibility rather than dependence on the state at its very hear. It seems there won’t be anything the welfare reforms won’t leave alone!! !.